Upon entering the final two weeks of my pregnancy I was happy to still be able to teach indoor cycling and even ride the trainer a bit. People seemed concerned about the fact that I was still teaching, but I felt fine on the stationary bike. 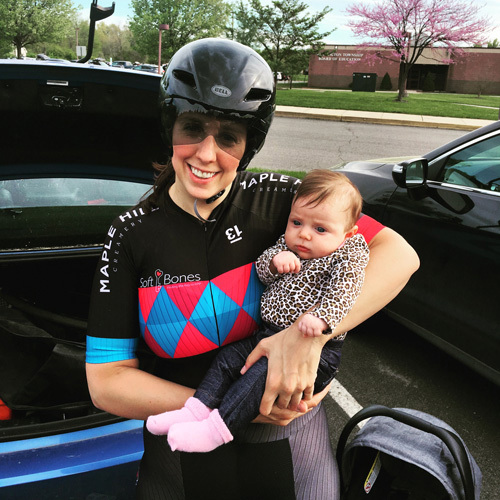 I had even ridden a little bit outdoors up until thirty-four or thirty-five weeks and so riding indoors at thirty-eight weeks was no big deal to me. I was expecting to teach until a week or so before my due date, but I was definitely not planning to ride on the day I gave birth, or so I thought. 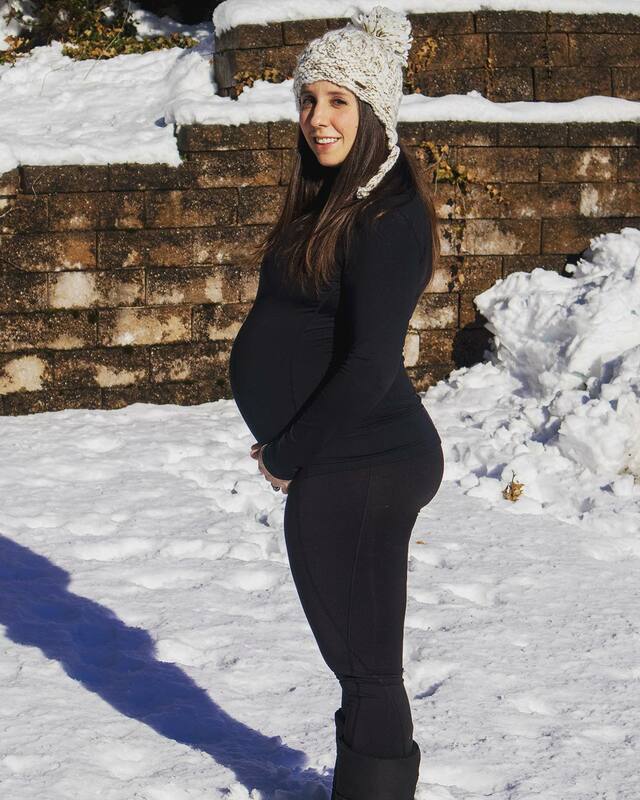 The day before I went into labor when I thought I still had a week to go. Last Monday morning, twelve days before my due date and a week before my scheduled C-section I taught an early morning indoor cycling class. This one class was no big deal in my mind, there were some days I was still teaching multiple classes. I started teaching class feeling pretty much normal, but by the end of class I felt more overheated than usual, out of breath, and was experiencing a little bit of dull pain. I chalked it up to the fact that I was thirty-eight plus weeks pregnant and told myself I would just take it easy when I got home. Sitting on the couch back at home, I still felt tired, out of breath and just not quite right, but I am used to pushing through fatigue and suffering and so I did just that. I had a doctor’s appointment later that morning for one final check checkup before the baby was to be born. 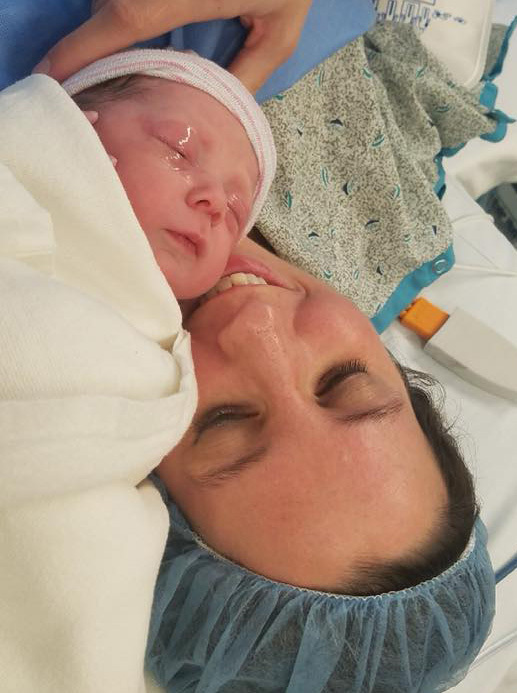 I arrived at the doctor expecting just another routine visit, but moments into the appointment he determined that I had already made it through early labor throughout the morning and that I was definitely not going to make it to the date of my scheduled C-section. I was surprised, but I thought I still had a couple more days to go. I went back home to tie up loose ends, but while in the midst of that I started to feel pains in my low back. Never having had a baby before I didn’t initially realize that these were contractions. After this went on for an hour or so, I finally called the doctor and he told me to go to the hospital immediately. Upon arriving at the hospital my other doctor informed me that I was not leaving and was in fact having my baby in just a couple of hours. By 4:35pm that day my baby girl was born, just nine and a half hours after I had finished teaching that early morning cycling class. I kept telling people that I planned on teaching until the very end of my pregnancy but I didn’t expect to actually teach a class on the day I gave birth. Now recovering from my surgery, I am happy to be able to walk just a half mile around the block, but I guess I am also happy that I was able to teach and train literally right up to the very end. 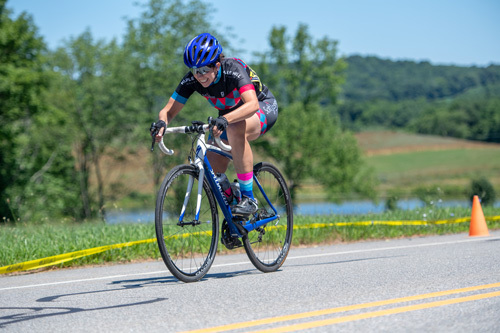 Now six or seven weeks of rest and recovery and then we will see if I can turn my jello legs back into those of a competitive cyclist and triathlete. In the operating room with my baby girl just moments after she was born.